Our most recent family adventure took us to Little Tokyo in Los Angeles. Downtown Los Angeles has many interesting places to visit; right adjacent in the downtown area is Olvera Street, China Town, and Little Tokyo. We have visited Olvera Street dozens of times, but we felt we should deviate from our normal pattern and try something new. And I am glad we did! Parking on a weekend in Little Tokyo was only $4. That was the first thing that made me happy. Upon arrival we began to saunter about trying to find somewhere delicious to eat. There were many noodle houses, sushi restaurants, and other traditional Japanese establishment that serve Udon, curry bowls, Ramen, teriyaki, and tempura. Many places looked delicious, but several were closed until the dinner hour. As we sauntered about we found a little Hibachi Korean grill that appeared to have decently priced lunch specials. Since we were traveling as a family, budget is important! Six adult portions really start to add up. We were seated immediately and given lemon ice water which was refilled as soon a we gulped it down. Los Angeles , along with much of the rest of the world, has been sweltering. The lunch choices were limited: teriyaki, Korean BBQ, and some Japanese and Korean appetizers. Basically, you just order what meat you want in what style: teriyaki or BBQ. Among the six of us we ordered beef BBQ, pork BBQ, chicken and beef teriyaki, and unagi (eel). Our lunch came 10-15 minutes later, each order served on a large tray. The lunch special included a huge sizzling platter of meat on a bed of caramelized cabbage, a green salad, steamed greens, sesame oil bean sprouts, a large bowl of rice, and kimchee. The next twenty minutes or so consisted of us unceremoniously snarfing pretty much everything in front of us. Even my ten year old ate just about everything; she even tried kimchee! My beef was sliced very thinly and had been marinated in a flavorful concoction. The rice was perfect. The kimchee was spiced perfectly–strong and flavorful but not overdone. I loved the sesame flavored crunchy bean sprouts. The food came out piping hot. In addition to the delicious food, the older couple running everything was very kind and friendly. What Korean food have you tried or what restaurants do you like? Sounds like a great Korean BBQ place! 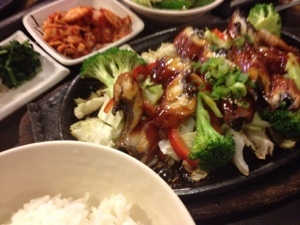 I love Korean food, it’s so delicious and healthy. It’s actually quite surprising how many people I mean who’s ever tried Korean food. they are missing out! I agree! I need to learn to make it at home do I can have it more often. Even though we has quite a feast I didn’t leave feeling heavy and greasy at all. Lots if veggies and the meat was very lean. hmmm I always though that it would be too hard, but I guess if you can make or by some good Kimchi it’s all just rice and toppings right? I am hungry for Korean now! Thanks for sharing! 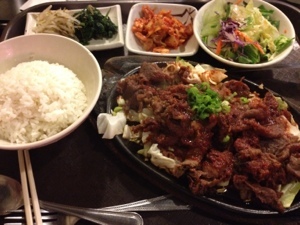 Where did you like to eat Korean food in Chicago? Did you have a place? I don’t remember the name but it was just up the L line of graduate student housing in Evanston.